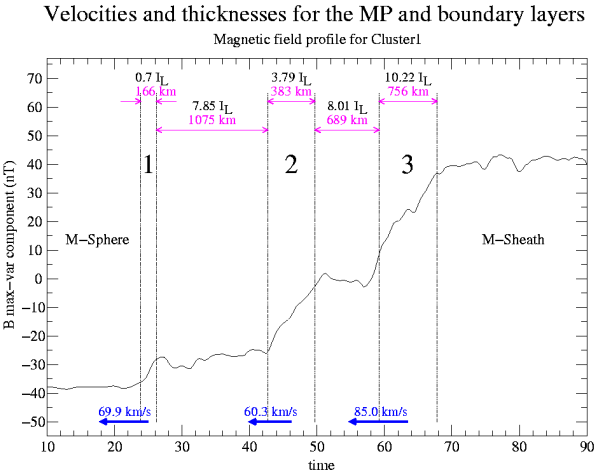 Investigation of magnetopause region with Cluster satellites. We are using a rich collection of methods to determine the geometry, dynamics and structure of the magnetopause (MP) region. These are single- or multi-spacecraft techniques, which either rely on certain conservation laws holding across a plasma discontinuity (like the minimum variance analysis (MVA) technique) either make use of the time-differences in the measurements acquired on-board the four Cluster satelites (like the timing analysis (TA) technique) or test whether the data comply with some discontinuity model (like the Walen and deHoffmann-Teller tests). The large variety of data and analysis tools provides a detailed picture and allows us to performe consistency checks and evaluate various assumptions underlying the models at the hard of these methods. As an example of this kind of investigation we present here a figure corresponding to an outbound MP crossing. The maximum variance magnetic field component (i.e. perpendicular to the magnetopause normal) is shown as a function of time for the case of Cluster1 satellite. Coming from the magnetosphere the satellite samples data from a double boundary layer (BL) before encountering the magnetopause itself (region 3) and finally exits in the magnetosheath. Because the inner-edges of the two BL regions posses a well-defined magnetic signature (the jumps in regions 1 and 2) a timing analysis has been performed on them as well as on the MP. On one hand this enable us to determine the thickness (shown in km and also scaled with the local ion-inertial length) and velocity of the structures observed during transition. On the other hand, comparing the normal to the surface separating the inner and outer part of the BL (region 2) provided by the TA and the normals inferred by other methods we were able to conclude that this is a tangential discontinuity. Indeed, by applying the MVA on the magnetic field, MVA on the current density and the TA methods for this region and for the MP region we obtained normals that all lye very close to each other (within a cone of 3 degree). The mentioned tangential character of region 2 explains why the plasma from the two adjacent regions comprising the double BL do not mix and suggests a possible different source or formation-time for them. A. Blagau, et.al., "The dayside magnetopause in the spring of 2004: A case study and a statistical report." Deutsche Physikalische Gesellschaft Tagung, Heidelberg, 13-16 March 2006.